RETIRED welder Ho Koon Lim, 65, stopped work 10 years ago but now worries that his savings will not be enough to cover his and his wife's medical bills. That worry has made him think about going back to work. He used to weld pipes at oil refineries but a leg injury forced him to stop working in 2001, when he was 54 years old. After he recovered from his injury six months later, he tried to return to his old job but there were no vacancies. He got a job as a security guard but quit after less than a week as he found it boring, and dismissed becoming a delivery driver as he worried he could not recognise road names in English, having studied only up to Primary 3. "I only know how to speak Mandarin and some dialects," he tells Insight. So after collecting his Central Provident Fund savings in 2002, Mr Ho decided to retire for good. He now helps to care for his two grandchildren, aged eight and 11, and exercises regularly. 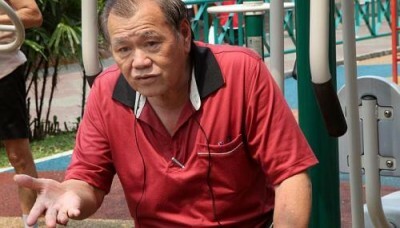 If more fit and able-bodied older Singaporeans like Mr Ho could be persuaded to return to work, that would help to alleviate the labour shortage. Of the two million employed residents last year, only 184,000 were 60 years old and above. That figure is however set to rise with the Retirement and Re-employment Act which took effect in January this year. It requires firms to employ workers up to age 65, if the workers wish to keep working. Companies can also tap into a government subsidy scheme when they hire seniors. The new law and subsidy scheme came too late for Mr Ho, who also fears being seen as a burden by employers due to his age and "low education". But that is typical of his generation. About seven in 10 Singaporeans aged 60 and older did not complete secondary education. Labour MP Ang Hin Kee says this group needs training focused on their needs, for example, to teach them "just enough simple English for them to do their jobs". When asked what would get him back to work, Mr Ho says he is willing to earn less than his last-drawn pay of $1,700 a month. He would be happy with $1,000 a month and medical benefits, as such costs worry him. He also hopes for a job that is near his home, to reduce travel time and transport costs. Mr Ang says older workers will have these expectations and it is up to employers to decide whether they can meet them. "If they can, we will be able to see more older workers being re-employed," he said.